I’m sure many of you have seen the astonishing video on YouTube called “Battle at Kruger.” I believe National Geographic did a special on it a couple of weeks ago. To briefly summarize, a pack of young lions attack water buffalo calf, takes him into a large watering hole and the battle begins. The lions struggle to take the calf out of the water when a huge crocodile grabs hold of the calf and tries to pull it away from the lions. The lions successfully pull the calf away from the croc, only to be confronted by a resurged group of adult water buffalo. Buffalo run off lions, calf lives another day. It is the hottest video in the history of Youtube. It is utterly fascinating. I was thinking about that video this morning. There was a mini-version of that video in my neighbor’s yard a few months ago. A stray cat had wandered into the backyard, doing what cats do and just setting himself up for an easy meal. A squirrel, doing what squirrels do, just setting himself up for a meal of an acorn, was not paying attention to his surroundings. The stray cat took notice of this oversight. The cat was crouching down as low to the ground as he could get…and suddenly pounced. The big gray cat had the squirrel in his paws momentarily. I’m thinking I’m seeing nature play out right here from my lawn chair. The little squirrel was fighting for all he was worth when suddenly ANOTHER squirrel (maybe the mate?) from a tree dropped down and joined in the fray. 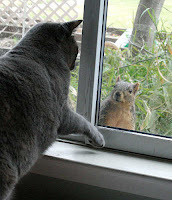 The second squirrel apparently bit the gray cat, causing the cat to let go of squirrel #1. Both squirrels ran up the tree to escape unharmed. However, the gray cat’s ordeal was not yet over. As he sat at the base of the tree licking his wounds, contemplating whether or not to go after squirrels #1 and #2, a blue jay came swooping down at the cat in attack mode. This caused said cat to duck and look up to see what was after him now. Blue jay comes down again at gray cat from behind giving him a glancing blow from either his beak or feet. Gray cat has had enough. Last I saw of him, the gray cat was jumping over the neighbor’s 6 foot fence in a single bound and faster than a speeding bullet OUT of there. Most likely, I will never see him again. I pulled a muscle in my stomach laughing that required muscle relaxers from my doctor. I did’t care. It was worth the pain. Actually, I found my own version of “Battle at Kruger” much more interesting. Wow, I see these weird things happen all the time living in the south. Considering I have 3 outside cats and an abundance of squirrels. I always feel bad when the squirrels lose though. The Battle of Kruger vid was good too,but lion vs. hyena remains my favorite to this date. ( http://www.youtube.com/watch?v=TNL1MR5aj1w ) Cheers! James, that was an interesting video. I noticed the lion just killed the hyena...he didn't eat him. I watched another video based on the same; lion vs hyena and lion munches on dead hyena for a few minutes and then walks off. Probably the only case of true murder in nature. Thnaks for that link. Hi David..enjoy reading your blog,love the video.I used to have cats,and they do love to do amusing things,sometimes getting hurt doing it.It is normal for animals fighting over something,food,territory,but it is sad to see humans behaving like animals,fighting over things that are not worth fighting and killing each other like there is no value to life. I would like to help you get those element,but I don't have a clue myself.I wanted to get a custom template for my blogs,but maybe later when I can get someone to help me do it :-)All the best to you.